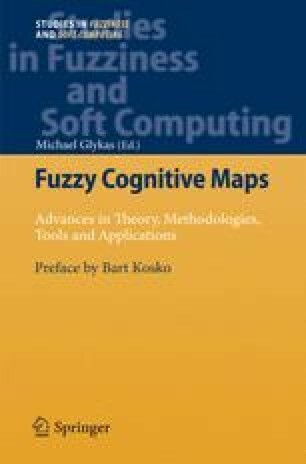 A novel approach for the construction of augmented Fuzzy Cognitive Maps based on data mining and knowledge-extraction methods has been investigated for decision making and classification tasks. Specifically, through this work, the issue of designing decision support systems based on fuzzy cognitive maps has been explored using fuzzified decision trees and other knowledge-extraction techniques. Fuzzy cognitive map is a knowledge-based technique that works as an artificial cognitive network inheriting the main aspects of cognitive maps and artificial neural networks. Decision trees, in the other hand, are well known intelligent techniques that extract rules from both symbolic and numeric data. Fuzzy theoretical techniques are used to fuzzify crisp decision trees in order to soften decision boundaries at decision nodes inherent in this type of trees. Comparisons between crisp decision trees and the fuzzified decision trees suggest that the later fuzzy tree is significantly more robust and produces a more balanced decision making. The new approach proposed in this paper could incorporate any type of knowledge extraction algorithm. Furthermore, through the knowledge extraction methods the useful knowledge from data can be extracted in the form of fuzzy rules and inserted those into the FCM, contributing to the development of a dynamic approach for decision support. The proposed approach is implemented in a well known medical decision making problem to preview the effectiveness. Janikow, C.Z. : Fuzzy Decision Trees Manual, free version for Fuzzy Decision Trees (1998) http://www.cs.umsl.edu/Faculty/janikow/janikow.html.